Designer of Edgy Brothers’ decks of playing cards (Dia de los Muertos playing cards and the Grimoire Series of Playing Cards), Dave Edgerly, decided to create his own specific playing card project – Mardi Gras Playing Cards. This custom deck of playing cards inspired by the celebration of Mardi Gras. Mardi Gras (French for “Fat Tuesday”) is refers to events of the Carnival celebrations, beginning on or after the Epiphany (a Christian feast day that celebrates the revelation of God the Son as a human being in Jesus Christ) or King’s Day and culminating on the day before Ash Wednesday (a day of fasting – 46 days before Easter). These playing cards appeal to Dave’s Cajun roots and should remind people the Carnival season in New Orleans (Louisiana, US). 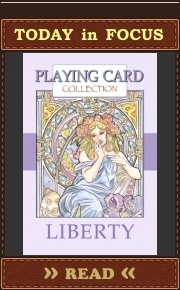 They are planned to be printed by the Expert Playing Card Company (EPCC). Mardi Gras reflects the practice of the last night of eating richer, fatty foods before the ritual fasting of the Lenten season (a period of approximately six weeks before Easter). It arrived in North America as a French Catholic tradition in the late 17th century, when King Louis XIV (a monarch of the House of Bourbon who ruled as King of France) sent Le Moyne brothers (French colonizers) to defend France’s claim on the territory of Louisiana. Purple deck is planned as a stretch goal for this project. Both deck will have custom seals. 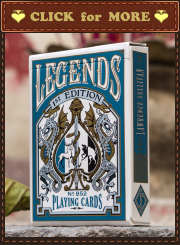 Will be printed by the Expert Playing Card Company (EPCC). 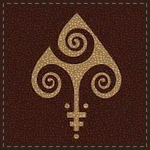 The back design of Mardi Gras playing cards reflects the theme of the playing cards. It involves the official colours of Mardi Gras: a) purple for justice; b) green for faith; c) gold for power. A mask as a universal international symbol of any carnival is in the center of the back design. Overall style of the mask and the background of the back design surrounding it should underline splendor and pomposity of French masquerades of 16-17th centuries and joy in modern frivolous interpretations of mixed cultural traditions. This is true for court cards as well. Court cards are represented by different participants of Mardi Gras. Each card has its own inspiration. Fleur de Lis, a very popular symbol in French heraldry, is used on all court cards as a design element incorporated into costumes of characters. It is a stylized lily or iris. The King of Spades. Dave’s inspiration hasn’t been revealed. The King of Hearts is inspired by the Krewe of Bacchus – the first Krewe* to have a celebrity King as well as parade on the Sunday before Mardi Gras. It is named for Bacchus, the Roman god of wine. The King of Clubs is inspired by the Krewe of Zulu Social Aid & Pleasure Club. One of the oldest krewes, they were established in 1909 and were the first African-American krewe. They dress as Zulu warriors and march with “blackface” make up. Pictured on the card is the most sought after Mardi Gras throw, the Zulu coconut. The King of Diamonds is inspired by the Krewe of Proteus, established in 1893. They get their name from the mythical son of Poseidon. The Queen of Hearts. Dave’s inspiration hasn’t been revealed. The Queen of Clubs is inspired by the many Dance troupes that march in the parades with the krewes. Most of the troupes make their own costumes and have very entertaining routines. The Jack of Diamonds is inspired by the Mardi Gras Indians. They are African-American Carnival revelers in New Orleans, who dress up for Mardi Gras in costumes influenced by Native American ceremonial apparel. French “Laissez les bon temps rouler” on the Ace of Spades translates into English as “Let the good times roll!”. The ace features the traditional King Cake. It is synonymous with Mardi Gras tradition in New Orleans. The name comes from the biblical three kings (a group of distinguished foreigners who visited Jesus after his birth, bearing gifts of gold, frankincense and myrrh). Depending on different countries and regions, King Cake is associated with the festival of Epiphany at the end of the Christmas season or with the pre-Lenten celebrations of Mardi Gras. King Cake was some type of dry French bread with sugar on top and a bean inside several hundred years ago. Nowadays, King Cakes are made of a cinnamon filled dough in the shape of a hollow circle. They have a glazed topping and are sprinkled with colored sugar. There is a small plastic baby hidden inside. Whoever finds it has luck and prosperity for the rest of the year or various privileges and obligations – it all depends on different regional traditions. Number cards are simple, but quite elegant. Frameworks are composed with small green glass beads. * Krewe is an organization that puts on a parade or ball for the Carnival season. The term is best known for its association with New Orleans Mardi Gras, but is also used in other Carnival celebrations around the Gulf of Mexico.